The BeachTek DXA-SLR ULTRA provides superb operation and ease of use to make capturing professional audio directly to your DSLR camera a snap. New, powerful preamplifiers give you exceptionally clean audio with plenty of punch. Your audio will always be recorded in sync with the video. Direct audio recording eliminates the need to have a separate audio recording device and syncing the audio in post. The DXA-SLR ULTRA is very easy to set up and use. The Neutrik brand combo XLR / �� inputs makes it easy to attach a variety of audio gear including wireless systems, mixers, sound boards and professional condenser microphones that require phantom power to operate. The inputs are transformer balanced for isolation and enhanced circuit protection. Built-in VU meters makes it easy to verify the proper input levels at a glance, while the level controls allow you to adjust the output signal for optimum recording. Built-in fast acting limiters prevent distortion from overly hot inputs for worry free operation. The phone jack lets you monitor the audio from the adapter during recording, or camera during playback. A unique feature of the DXA-SLR ULTRA is the sleek detachable rod support system to easily attach a matte box, follow focus and other gear for incredible versatility. Includes two 3? rods that are threaded on both ends. Extra rods can be simply threaded on to extend to any length needed. 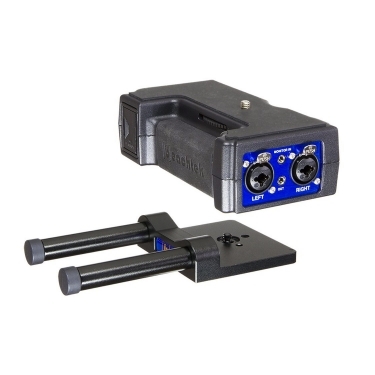 Everything about the adapter was designed to be extremely easy to use, from the ergonomic all metal chassis with nice rubber grips, to the bright easy to read VU meter and drift free volume controls. Nothing could be easier to use or provide better performance.